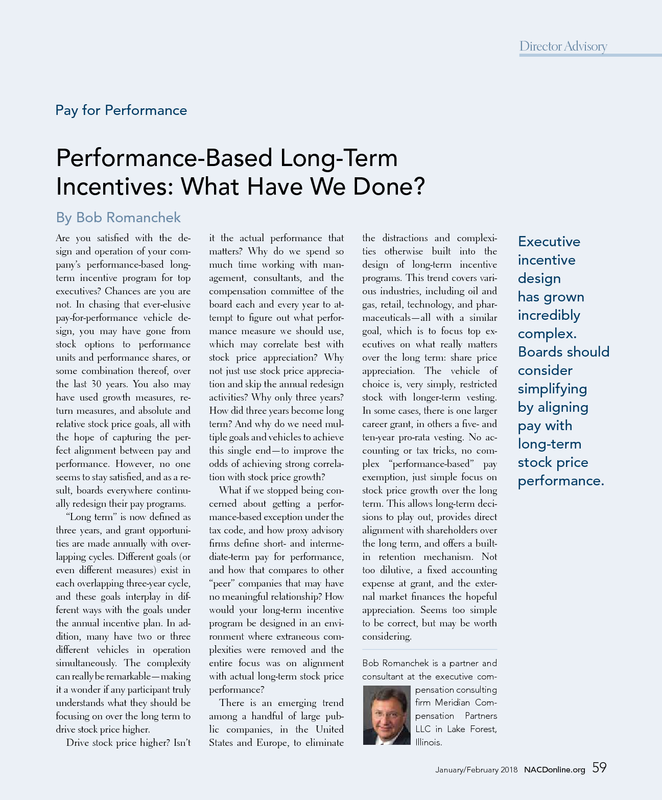 Performance-Based Long-Term Incentives: What Have We Done? From January/February 2018 NACDonline.org - Executive incentive design has grown incredibly complex. Boards should consider simplifying by aligning pay with long-term stock price performance. Are you satisfied with the design and operation of your company’s performance-based longterm incentive program for top executives? Chances are you are not. In chasing that ever-elusive pay-for performance vehicle design, you may have gone from stock options to performance units and performance shares, or some combination thereof, over the last 30 years. You also may have used growth measures, return measures, and absolute and relative stock price goals, all with the hope of capturing the perfect alignment between pay and performance. However, no one seems to stay satisfied, and as a result, boards everywhere continually redesign their pay programs. “Long term” is now defined as three years, and grant opportunities are made annually with overlapping cycles. Different goals (or even different measures) exist in each overlapping three-year cycle, and these goals interplay in different ways with the goals under the annual incentive plan. In addition, many have two or three different vehicles in operation simultaneously. The complexity can really be remarkable making it a wonder if any participant truly understands what they should be focusing on over the long term to drive stock price higher. Drive stock price higher? Isn’t it the actual performance that matters? Why do we spend so much time working with management, consultants, and the compensation committee of the board each and every year to attempt to figure out what performance measure we should use, which may correlate best with stock price appreciation? Why not just use stock price appreciation and skip the annual redesign activities? Why only three years? How did three years become long term? And why do we need multiple goals and vehicles to achieve this single end—to improve the odds of achieving strong correlation with stock price growth? What if we stopped being concerned about getting a performance- based exception under the tax code, and how proxy advisory firms define short- and intermediate- term pay for performance, and how that compares to other “peer” companies that may have no meaningful relationship? How would your long term incentive program be designed in an environment where extraneous complexities were removed and the entire focus was on alignment with actual long-term stock price performance? There is an emerging trend among a handful of large public companies, in the United States and Europe, to eliminate the distractions and complexities otherwise built into the design of long-term incentive programs. 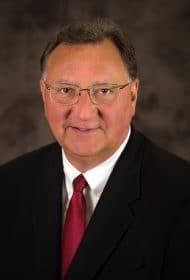 This trend covers various industries, including oil and gas, retail, technology, and pharmaceuticals— all with a similar goal, which is to focus top executives on what really matters over the long term: share price appreciation. The vehicle of choice is, very simply, restricted stock with longer term vesting. In some cases, there is one larger career grant, in others a five- and ten-year pro-rata vesting. No accounting or tax tricks, no complex “performance-based” pay exemption, just simple focus on stock price growth over the long term. This allows long-term decisions to play out, provides direct alignment with shareholders over the long term, and offers a builtin retention mechanism. Not too dilutive, a fixed accounting expense at grant, and the external market finances the hopeful appreciation. Seems too simple to be correct, but may be worth considering.